Rossini is a giant of the Italian opera world (both in terms of output and girth—he was a gourmand as well as a musical genius!). Handsome Count Almaviva has fallen head over heels for the pretty Rosina, but wants to make sure she's into him, not his title. He disguises himself as a poor student and serenades her. But he's getting nowhere, and if Rosina's guardian Bartolo has his way, no suitor will get anywhere near his ward. Thwarted, he enlists the help of Figaro, a neighbourhood barber with plenty of tricks up his sleeve, and more importantly, access to Bartolo's household. Will disguise and deception be enough to win the day for romance? Figaro: a barber, fix-it-man, all round helpful guy! In countless ads, in animated cartoons including Bugs Bunny, in Mrs Doubtfire, in The Simpsons. 'The Rabbit of Seville' is a classic Bugs Bunny episode. Rossini was a master of his craft, and often took musical devices and used them in new ways. 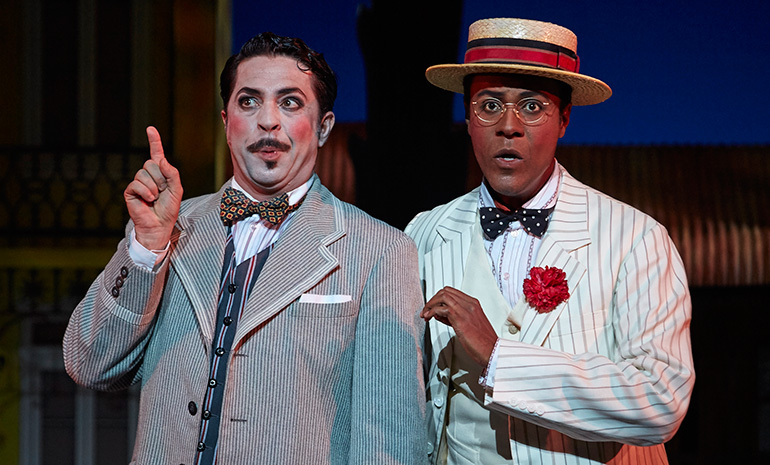 Listen out when Figaro introduces himself in the famous aria 'Largo al factotum' for a prime example of patter singing—where a comic character sings at a very, very fast tempo with just one syllable to each note. The rhythm patterns are difficult and the lyrics are often tongue-twisters. As the action gets crazier and crazier on stage, Rossini can make it feel frenetic in the music—getting faster and louder as things get out of control. Don Basilio's 'La callunia' is a good example. As Basilio describes how a lie can go from a whispered rumour to a full blown town scandal, the orchestral accompaniment builds and builds in volume, until the teacher sings 'like a blow on the cannon' and the percussionist pounds on the bass drum. You can just imagine the volume of gossip in the town! Rossini also perfected the double aria: beginning with a slow section to show off the singer's beautiful voice (and his own beautiful melody), followed by a fast, difficult section which shows off a singer's agility and technique (in other words, the perfect audition piece!). Elijah Moshinsky's take on the most popular comic opera in the world. It is set in the 1920s and draws on popular archetypes from silent films of the era. 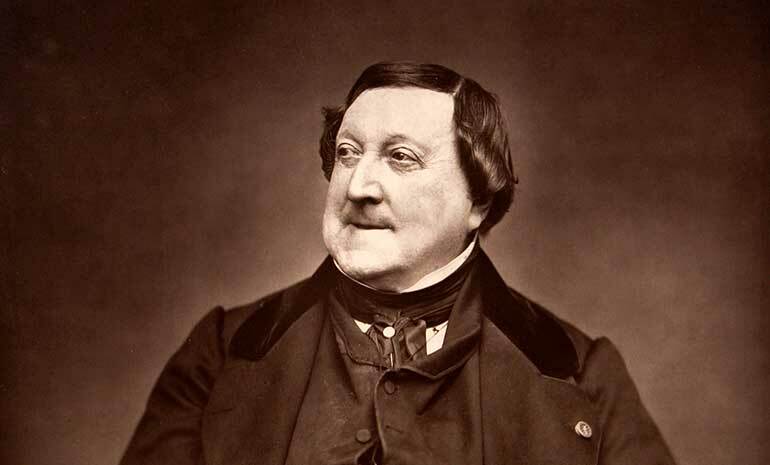 Rossini was young, but immensely successful when he began work on The Barber of Seville, daringly choosing to work on a Beaumarchais play with an already famous setting by an older composer, Paisiello. With a new libretto by Cesare Sterbini, it premiered on February 20, 1816 at the Teatro Argentina in Rome, to a very hostile audience. Legends about that disastrous opening night abound—from a singer tripping over a loose board, to a cat wandering onto the stage, to an awkward pause while the tenor tuned his guitar before beginning a serenade! It's possible that the audience was filled with Paisiello's supporters, and the loud whistling and catcalls obscured much of the music that night. Whatever did happen, we know it did not go well, and Rossini was convinced the opera was a failure. The second performance was a very different story—the opera was a triumph, and soon enough, Paisiello's earlier effort was forgotten. The opera contains some of the most familiar opera music in the world today, and the work is the 7th most performed opera around the world. Rossini plagiarised from himself all the time, so if you’re wondering if you’ve heard that melody before, it might have been from a different Rossini opera. Beethoven (who had no love for Rossini) famously praised the composer saying, "above all, make more barbers!" The original overture to The Barber of Seville was lost—and Rossini replaced it with one he'd written for an earlier opera. That's the famous work we know today—which contains none of the music from the actual opera. The composer: Rossini. An Italian composer famous for his comedies. The setting: Originally set in Seville in the late 1700s, this production updates the action to the 1920s, drawing on the archetypes of silent films. The history: Everything went wrong on opening night, and the première was a disaster. Second night was a different story and it's now Rossini's biggest hit. A quirky fact to impress your date: Born in a leap year, Rossini enjoyed the idea that he only had a birthday every four years. On his 76th birthday, he invited friends around to celebrate his 18th!